A heist! This stingless bee is attempting to bypass the tubular route and cut a hole at the base of the flower to commit nectar robbery! 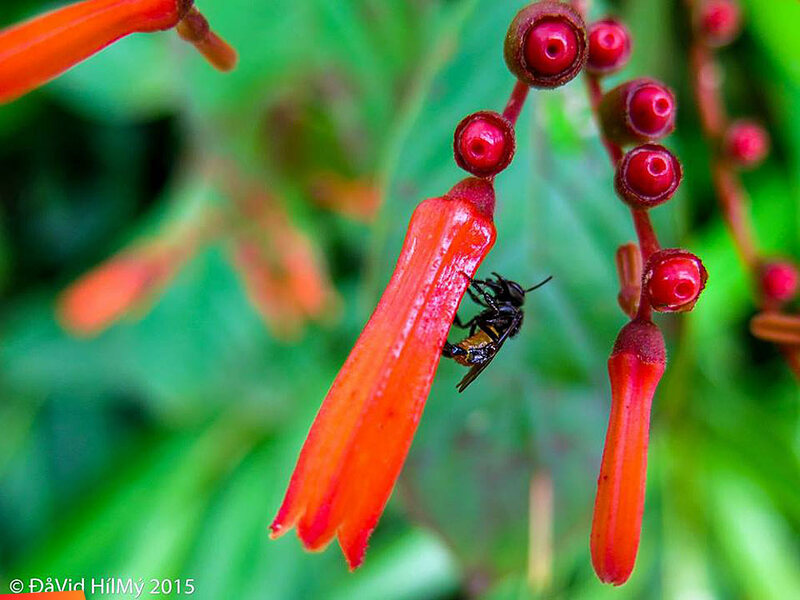 The bee is the Jatai stingless bee, Trigona fulviventris, and the flower from the Firebush, Hamelia patens. It is interesting to note that this species of bee has been documented to demonstrate spatio-temporal (also called time-place) learning behavior, the ability of some individuals in the colony to associate the time and place of an event especially in foraging, anticipating success by arriving up to 30 mins ahead of a feeding event and staying as much as 30 mins after it was "scheduled" to be available.